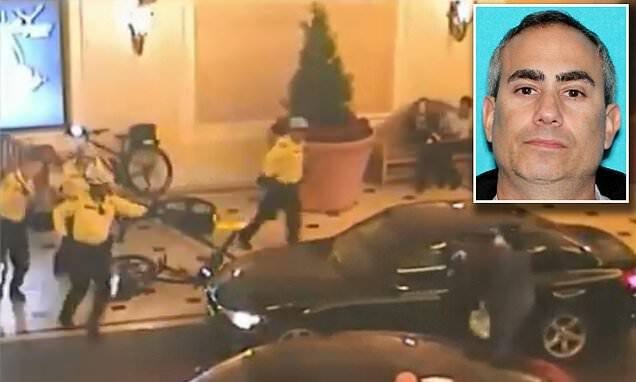 Shocking footage shows the moment that a convicted felon tried to carjack an unsuspecting victim before he was gunned down by police in a shootout at the Bellagio on Saturday. Michael Charles Cohen, 49, is seen accosting a woman driving a black Mercedes just before the shootout took place around 9.45pm. Four officers notice the commotion and rush over to the man, who starts firing at the policemen. Cohen hits one of them in the chest. 'This could have been very tragic for our officers, as well as citizens within our community, or that lady who was in that car,' Charles Hank, Assistant Sheriff, explained to KTNV. Prior to the attempted carjacking, Cohen had tried to get away in a white vehicle but he couldn't find the keys for it. Cohen had allegedly walked into the Vegas casino, and approached the poker cage where he demanded they hand over their cash. He then fled out of the north entrance. Unfortunately for the robber, the Bellagio was already crawling with police that night, as they were investigating an unrelated missing child case. Officers caught up with the suspect outside in the valet lot where he was attempting to car jack a vehicle. A shootout then occurred after the suspect opened fire, police say.